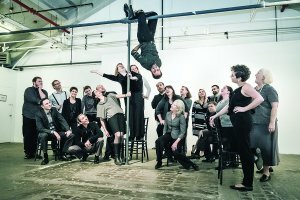 For the winter concert of their eleventh season, the twenty-three member C4: The Choral Composer/Conductor Collective – elected to honor “The Unusual – music of the strange, the absurd, and the surreal.” The evening included three premieres, all by current C4 composers, among the eight pieces performed. Some of the works were splendid and some weren’t, but all were presented with C4’s characteristic superb musicianship and artistic integrity as well as their willingness to take risks. The opening work, Martha Sullivan’s 2012 Tyger, Tyger, is a lovely piece. Its deceptively easy music mimics William Blake’s “simplicity,” that quality of accessibility that has placed Blake’s poem in as many children’s poetry anthologies as adults’. The compact rhythm kept the forward movement of the work steady, purposeful, and as tightly controlled as the stealth quality of a big cat’s stalking; unexpected harmonies mimicked the cat’s magic equilibrium in terrains where other creatures would lose their balance. The soloist’s lines – beautifully sung by Melissa Wozniak – called up otherworldliness: Blake’s Tyger, “burning bright, in the forests of the night” belongs to both God and the wild. The concluding last choral syllable – ‘ger’ of ‘tyger,’ rendered ‘gggrrrrrrr’ – returned singers and audience alike to the world of play. The second work of the evening, Tape Recorder by Gordon Williamson, was one of the concert’s most conceptually substantive and musically mature; happily, it was the 1st Prize winner of C4’s 2015 Commissioning Competition. As Williamson explained in the program notes, he was inspired in his composition by the poetry – and poetry reading style – of Zoe Skoulding: interested in uses of taped and recorded spoken words in manipulating time, the composer created a five-minute “soundscape based on a ca. 15- to 20-second imagined reading by the poet.” The singers “sang” tape-recording sounds as well as “regular” music. In this sense, Williamson’s music shows his close kinship with the many contemporary composers who are asking musicians to “play” instruments in entirely non-conventional ways. Skoulding’s lyrics explore issues of messages and meanings played, re-played, erased and remembered before new messages begin. The parallel concerns of Williamson’s music centered on intelligibility and blur, the place of both memory and expectation in recorded sound and ‘live’ music, and the human need to dispense periodically with ambiguities and revert to the simple optimism of “hello.” The textured, intelligent music evoked in sound the work of painters, photographers and film-makers who have played with notions of reality and distortion in sights seen by the naked eye, through windows, distorting lenses, in mirrors, or behind scrims. The music’s discipline and maturity relieved the exploration of these complex – though familiar – questions from any reduction to facile cliché; Tape Recorder is a substantive, thoughtful and rigorous work. The third piece of the evening was Karl Saint Lucy’s Or Delirium, a premiere. The theme of longing was recognizable in dense choral writing in which moments of melody emerged when soloists sang brief individual lines. However, the feel of disconnectedness among the individual sections of this short (not quite five-minute-long) work ultimately made it unsatisfying. The core intention of the work in both the music and Emily Claman’s poem – to explore the fact that “We just want so much” – was clear, but the concept faltered in execution in spite of C4’s fine singing. The last piece of the first half of the concert, also a premiere, was Brian Mountford’s The Devil’s Dictionary, set to selected texts by American writer Ambrose Bierce (1842-1914). Between 1881 and 1906, Bierce published in newspaper weeklies close to 1,000 “definitions” of common words examined with the satirist’s tools of wit, disillusionment, disgust, and wistful resignation. Mountford chose 15 of these words for musical rendering; some lasted two or three minutes, others a mere 45 to 90 seconds. C4 sang and staged these individual word-songs with humor and a sense of glee. Each little “piece” was a bauble; most were funny, though a few seemed like inside jokes which not everyone got. Altogether, there were some delightful vocal gymnastics and an overarching feeling of fun. But it was a bunch of baubles. Wouldn’t it be wonderful if – over the next year or two – Mountford took all the baubles (air, allegiance, apologize, battle, circus, duty, envelope, kilt, mayonnaise, meekness, patience, philosophy, positive, reverence and year) and strung them into an extended text of Bierce-ian, twenty-first century satirical meaning placed into a bravura choral display? After intermission, the concert continued with a 2012 piece Pitter patter, pitter patter; and then by Daniel Andor-Ardo, the evening’s most political piece. The poem by Zsuzsanna Ardo tells a poignant and terrible story. Rain begins slowly and then becomes torrential, and a Dwarf fears she will drown. She appeals to the Rainbow for safety and salvation, and is condemned to the awful unspecified “And then” when the Rainbow says only, “I don’t know you.” It is a heartbreakingly beautiful piece of music. As the chorus moves the musical “pitter patter” from cool steadiness to relentless ferocity, the narrative arc is set: listening, the audience knows that tragedy is inevitable. The Dwarf’s plaintive “Will you take me?” is rendered more awful by the terrible hushed quiet of the music’s conclusion: the storm, once over, has obliterated every trace of the Dwarf’s existence. In the program notes, Andor-Ardo makes explicit reference to contemporary global refugee crises, but the music is compelling enough to stand as a paradigm for turmoil and obliteration.The next piece, the third premiere of the evening, was Colin Britt’s The Agony and Ecstasy, a gorgeous setting of a poem by thirteenth century Persian Sufi mystic, Rumi. Britt’s writing here is rich, lyrical and lush; the whole chorus became often as fully sensuous as a Romantic symphony even as individual voices – both singers’ and sections’ – retained individual lines and identities, each embodying different kinds of love and yearning. 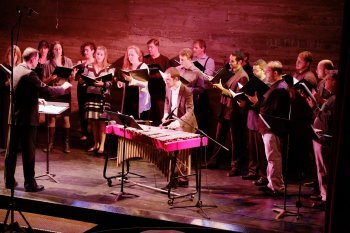 In some ways, Britt’s choral writing in The Agony and Ecstasy represented the most conservative and therefore traditionally accessible music of the evening, but the freshness of his ability to make delicacy and lushness such close partners in presenting Rumi’s mystical desire-paradoxes was thrilling. The next piece, the third premiere of the evening, was Colin Britt’s The Agony and Ecstasy, a gorgeous setting of a poem by thirteenth century Persian Sufi mystic, Rumi. Britt’s writing here is rich, lyrical and lush; the whole chorus became often as fully sensuous as a Romantic symphony even as individual voices – both singers’ and sections’ – retained individual lines and identities, each embodying different kinds of love and yearning. 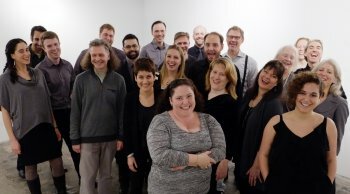 In some ways, Britt’s choral writing in The Agony and Ecstasy represented the most conservative and therefore traditionally accessible music of the evening, but the freshness of his ability to make delicacy and lushness such close partners in presenting Rumi’s mystical desire-paradoxes was thrilling. Immediately following these two serious pieces was Tales from the Bizarro World by Chris Opperman who wrote both text – a somewhat-sung play of sorts – and music. Bizarro World presents a class in which what’s wrong is right and vice-versa, and a smart, normal girl learns how to be right … that is, wrong. It was an entirely light-hearted theatre de l’absurde, an extended goof. Musical virtuosity and slapstick were deftly performed; for nine minutes, C4 became an exuberantly sweet musical theater troupe. The last piece on the program was also the oldest: French composer Philippe Hersant’s Allegories, a setting of three poems by Arthur Rimbaud (1854-1891) was composed in 1998. This three movement piece – Childhood, Youth, Departure – manages to be simultaneously narrative and meditative, mournful and ennervating, urgent and reflective. It is contemporary French classical choral music at its best. As always, individually and collectively, C4 sang beautifully. In addition, they continue to embody a rare capacity for artistic and musical collaboration. In this single evening, eight C4 members each conducted one of the eight pieces; composers let colleagues conduct their works, in which they themselves sang; many members sang solos; one played an autoharp and another was a dictionary lector. C4, above all, true to their interconnected goals of “passionate advocacy of new choral works” combined with performing, premiering and commissioning “new choral music, and mentoring emerging singers, composers and conductors of today’s choral music,” performed with elegant integrity and a palpably joyful commitment to their art.